* Roar recommends parents should consider whether the event is appropriate for their child. 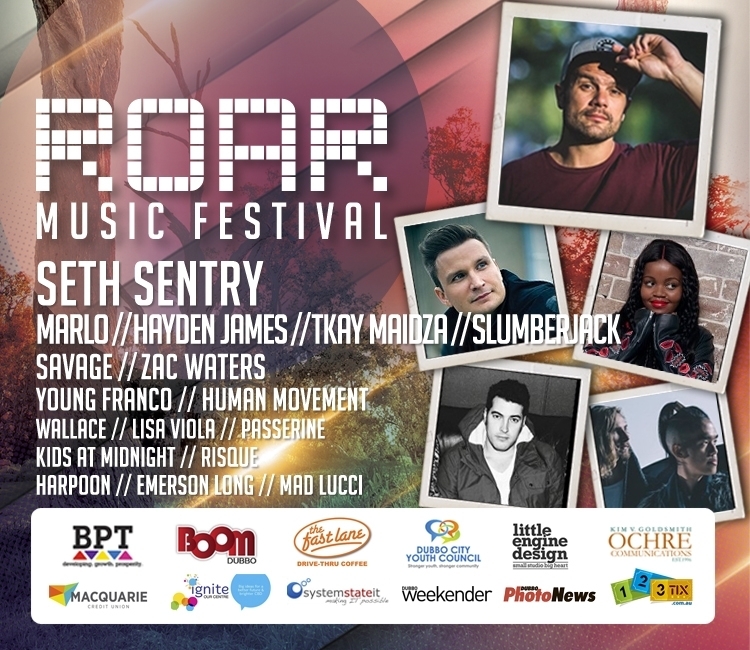 Roar Festival is a music event being held for up to 10,000 young (15+) people running for 11 hours in Dubbo on April 9th 2016. Roar will see visitors from around the region and across Australia come together to see and hear some of the best international, national and local DJs on 2 stages. Seth Sentry, Marlo, Hayden James, Tkay Maidza, Slumberjack, Savage, Young Franco, Human Movement, Zac Waters, Passerine, Lisa Viola, Wallace, Kids At Midnight, Risque, Harpoon, Mad Lucci, Emerson Long, Raw to Roar Winner & Raw to Roar Wildcard.